Faculty and graduate students of York University’s Department of Politics, Faculty of Liberal Arts & Professional Studies (LA&PS), have collaborated to publish a book on radical left politics. 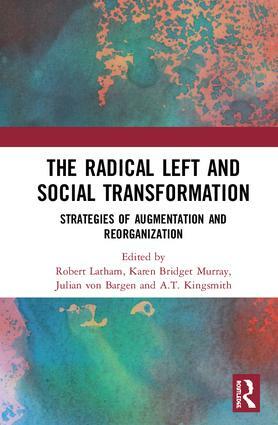 Faculty members Adam T. Kingsmith, Karen Bridget Murray and Robert Latham, along with doctoral candidate Julian von Bargen, are editors of the recently published book The Radical Left and Social Transformation: Strategies of Augmentation and Reorganization. The book is a timely scholarly intervention into debates about the future of the radical left, particularly as the political landscape faces a resurgent far right. Contributors draw upon and reinvigorate debates within Marxian-anchored thought in relation to an assemblage of urgent issues of our time, from mass migration to increasing inequalities in a host of forms. Nine papers, with respective replies, analyze the potential for social transformation through a reinvigorated radical left, all within the context of the ascendance of the far right worldwide. Papers variously take up new lines of analysis, while also identifying and theorizing strategies and possibilities for increasing and deepening popular participation and support on the far left. Authors are drawn from Australia, Britain, Canada, Cyprus, France, Greece, Ireland, Japan, Slovenia and the U.S., and feature new scholars as well as established and leading theorists and activists, including Kojin Karatani, Michael Löwy and Ronaldo Munck. Collectively, the papers address three predominant themes: the changing and expanding conceptualization on the left of contemporary capitalism; what it means to speak of “the people” in relation to political action today; and approaches to mobilizing and organizing that people. The wide-ranging but focused and rigorous insights produced across these pieces are aimed at speaking to scholars, students, observers and activists who seek knowledge about the challenges and opportunities the left faces today. Collectively, the book’s contributors speak to the political import of new knowledge and suggest new approaches for gaining a better grasp of what challenges the radical left faces and how problematic barriers might be torn down. The authors evaluate the difficulties of augmentation across multiple planes, including the tension between migrants and citizen workers, the changing nature of capitalism, the uneasy relationship between sovereignty and class and the contradictions operating across international versus domestic dynamics. More information is available online about The Radical Left and Social Transformations: Strategies of Augmentation and Reorganization.